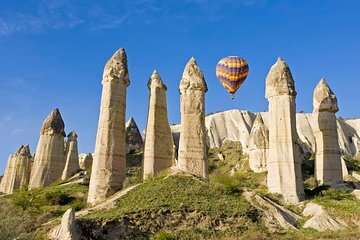 Take a break from the beach and head inland to discover the UNESCO-listed landscapes of Cappadocia on this 3-day coach tour from Alanya, including accommodation, breakfast and dinner. Enjoy an action-packed itinerary that includes a tour of Uchisar Castle and Cavusin village, and plenty of opportunities to photograph the iconic fairy chimneys in the Dervent, Pasabag and Pigeon valleys. You’ll also have chance to visit Konya, Turkey’s spiritual center; try making pottery in Avanos and visit an underground city, as well as optional extras like a sunrise hot air balloon flight or a Turkish folklore show.